Synchronized swimming London Olympics: A brief history of the most-ridiculous sport at the games. 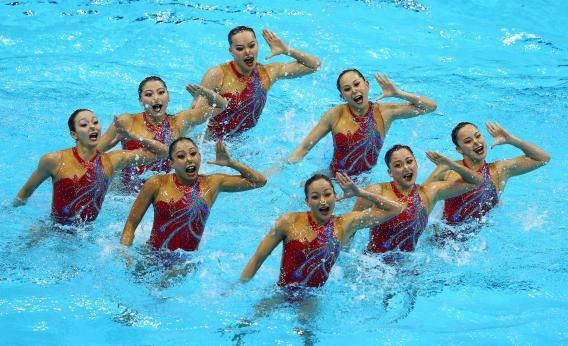 China competes in the women’s teams synchronised swimming technical routine on day 13 of the London 2012 Olympic Games. Yes, synchronized swimming is the most-ridiculous Olympic sport, and that’s even before you add in those fearsome wolf bathing suits. But let’s be clear: It definitely counts as an athletic activity. (Try it yourself, and then see how funny you think it is.) Swimmers perform an intricate, tightly choreographed aquatic dance routine that starts on the deck of the pool, where they march out in unison, strike poses, and take to the water in ostensibly artistic fashion. The sport requires great strength, endurance, grace, and timing. You also have to smile the whole time, even if your teammate just botched that twirly thing she was supposed to do. 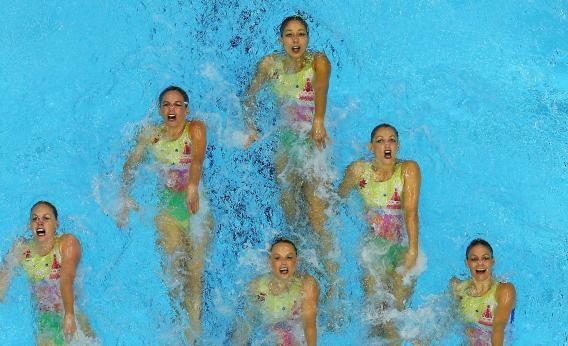 Olympic synchro comes in two- and eight-person varieties. Competitors perform technical routines, in which they’re judged on how well they execute various required elements, and free routines, which put more of an emphasis on artistic interpretation. The performances last between two-and-a-half and four-and-a-half minutes. Check out this one, from the 2000 Sydney Games, in which the Japanese team engages in some intimidating karate-inspired maneuvers. Also not to be overlooked, though it didn’t come during the Olympics, is Team Canada’s cowboys and Indians routine from 2009. In a letter to Oliver Reeve, Franklin described his swim in the Thames from Chelsea to Blackfriars, performing, on the way, “many feats of activity, both upon and under the water, that surprised and pleased those to whom they were novelties.” He authored a book, The Art of Swimming Rendered Easy. … [It] was published in Glasgow in 1781. More than 100 years after Ben Franklin’s damp balletics, a vaudeville performer named Annette Kellerman toured the country giving stunt-swimming exhibitions. Kellerman later went on to Hollywood. “But for swimming, I might have been hobbling about on crutches instead of making my regular livelihood today as a moving picture mermaid,” she said in 1918. (Hooray for America!) Later, the films of Esther Williams, “America’s Swimming Sweetheart”—which featured singing, dancing, and spectacular synchronized swimming displays—helped promote harmonious marine movement to the entire world. In her exceedingly odd paper “A History of Synchronized Swimming,” Synthia Sydnor notes that the first synchronized swimming club was founded in the 1920s. This was also the age in which the endurance sport of flagpole-sitting became amazingly popular. So why did synchro make the Olympics, while perching on a pole is still awaiting its hipster-fueled comeback? As you might have suspected, you can blame the 1933-34 Century of Progress World’s Fair. A woman named Kay Curtis was the driving force behind promoting synchronized swimming as a sport rather than just a watery dance craze. At the Chicago World’s Fair, Curtis put together a synchronized swimming show called the Kay Curtis Modern Mermaids. Their performances were hugely popular, drawing thousands per exhibition. Some of those people returned to their hometowns and founded synchronized swimming clubs of their own. In 1939, Curtis helped plan the first competitive synchro meet; in 1941, the Amateur Athletic Union sanctioned synchronized swimming as a bona fide competitive sport. After a long, soggy slog, synchro finally became an Olympic sport in 1984, when duet and solo synchronized swimming made their debuts. “Solo synchronized swimming? Has the world gone topsy-turvy?! ?” you might ask. Well, simmer down, cranky. It was sort of like a gymnastics floor routine, with a swimmer performing along to music. Regardless, it was dropped in 1992 in favor of the team synchro event that we all know and love today. Canada’s soccer-themed outfits in the women’s teams synchronized swimming competition. Photo by Adam Pretty/Getty Images.